Victoria’s passion for textiles, design and colour has taken India Beat to Bagru, Jaipur where we have launched our fantastic hand block printing workshops. As an aside we are also very excited to have designed our own, signature print and created our beautiful silk / cotton scarves. We have a limited number for sale in Indigo or Jaipur Pink. To purchase your own stunning scarf please contact us. The scarves are $85 + shipping. Our scarves are printed using natural dyes. They are a luxurious blend of silk and Indian cotton, 2 metres x 90 cm +/-. The long sides are natural selvedge, the ends are unfinished. 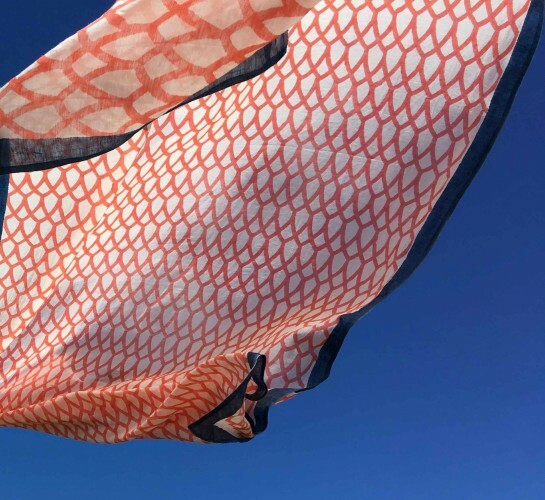 Each scarf is hand block printed by a master printer and takes a minimum of 5 days to create. Each scarf comes packaged in our own hand made India Beat pouch. Like all hand block printed textiles slight variations in colour and print should be expected. To learn more about our hand block printing workshops please click here.